Villa Alamanda is a small and intimate, three-bedroom villa designed for a family or small group of friends and has the double advantage of being a great spot for people looking to get away from it all while also being in a prime position to sample all that is good in life. With all the number of shops, restaurants, and bars located along the main road and in the five star resorts of nearby Nusa Dua guests can also take advantage of the great water sports operations and white sand beaches that Bali is renowned for located only minutes away. Entering through an antique Balinese door and stepping over a small fish pond Villa Alamanda welcomes you into its intimate embrace with a generosity of space. There are two bedrooms downstairs at either end of the villa (one of them double and other twin) with the third master bedroom upstairs that taking in the ocean and sunset views. Each bedroom has an ensuite with monsoon showers and comes with its own small balcony or terrace. The middle space is a well-lit, high-ceilinged, multi-purpose living / dining / kitchen area with a dining table for six, soft couches, a flat screen TV with satellite TV and satellite channels, and a kitchen. A water wall at the back of the room brings the relaxing sounds of moving water inside, and French doors open up to the garden to allow the breeze to circulate throughout the villa. A terrace with 3 sun loungers runs alongside swimming pool which is in turn is surrounded by a well manicured lawn and simple tropical gardens. Round table with chairs is nice place to have 5 o’clock tea or dinner by the pool. 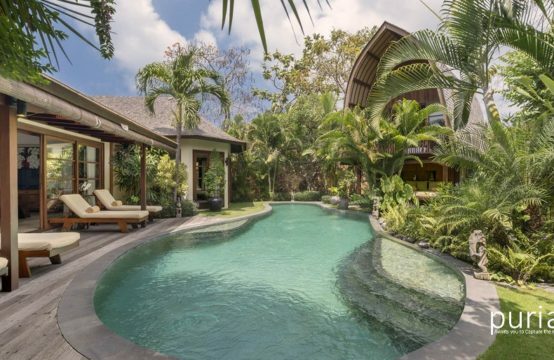 Set in a quiet and secluded spot on the Benoa Peninsula in south Bali, Villa Alamanda is one of an enclave of five villas known as the Puri Tirta Villas. Set back from the water, Villa Alamanda has access to its own private jetty with access to canoes and a private speed boat for exploring both the mangroves and the offshore islands. *Rates are subject to 15,5 percent government tax & service charge. Please note the above rates are valid until 4 Apr 2018. Please email us if you would like to make a booking after this date.